Canon’s update to the popular, pocket-friendly PowerShot S100 series see this year’s model, the S120, relatively unchanged save for a few minor updates. The most significant of these is a slight increase in lens brightness from f2.0-5.9 to f1.8-5.7, and bringing the S120 into line with rival high-end compacts using the relatively small 1/1.7-inch CMOS sensor. Other enhancements include, faster autofocus says Canon, along with a higher resolution rear touch screen (with AF control during video), improved WiFi connectivity, and a new 60p option for HD Video capture. 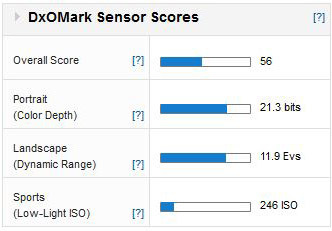 In our tests, the PowerShot S120 attained a DxOMark Sensor score of 56 points, and slightly higher than expected for a camera like this. 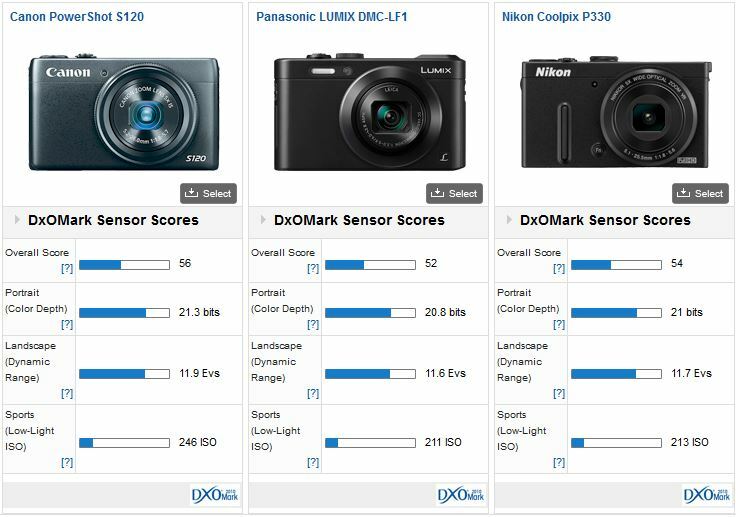 Scores are just ahead of the Nikon P7800. The Canon has nearly identical color depth but a fraction wider dynamic range (at base) and slightly better low-light scores. In real world use there would be very little between them on image quality, though difference in the low-light performance may just be noticeable to the trained eye. 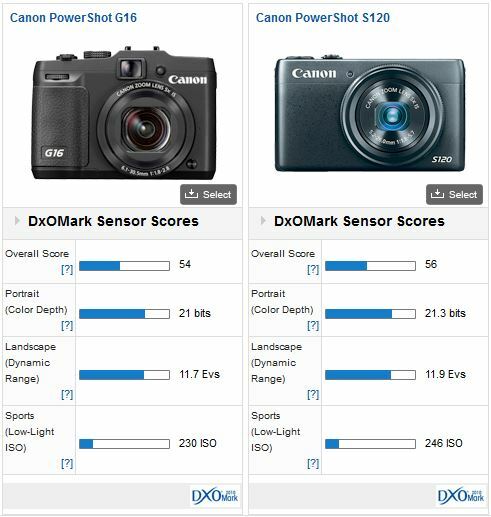 Compared to firm’s PowerShot G16, which shares a number of core technologies but competes with the Nikon P7800, the S120 actually is marginally ahead in our rankings. In every-day picture taking, all three models have fundamentally the same image quality. Compared with the new EVF-equipped Lumix DMC-LF1 from Panasonic and the Nikon Coolpix P330, the Canon is ahead in the rankings but the difference would barely be noticeable between it and the Nikon. Even with 4 points over the Panasonic, the Canon has around a +1/3rd of a stop improvement in IQ in total and the same +1/3 stop advantage in color depth, and dynamic range. 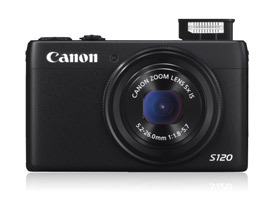 As a highly portable model with well-balanced spec, the $449 PowerShot S120 has a great deal of appeal. And it compares well with rival offerings in terms of capabilities and image quality. Being very slightly ahead of the curve in each of the metrics, Canon has wrung every possible improvement in image quality it could make from the sensor.